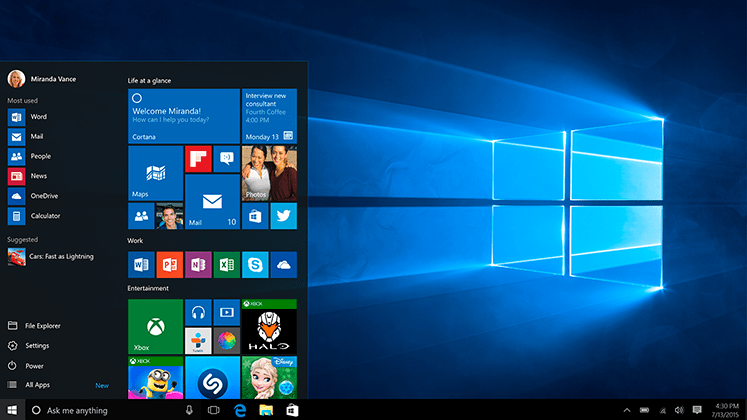 Home/Operating Systems/Windows 10: Should You Upgrade? As many current Windows Â users have noticed through recent Windows updates, July 29th marked the launch of Microsoftâ€™s latest installment in the Windows operating system; Windows 10. Microsoft is, unsurprisingly, very excited about this latest product launch and they have made their position on upgrading to Windows 10 loud and clear- if you are running Windows 7 or 8 currently, they would like you to upgrade, they are even allowing users to upgrade for free! While the lure of innovation and free software (especially for historically expensive software like Windows) may be enticing for early-adopters of new tech, many users may have a varying perception of the changes. Many users, especially in the business arena are still resting on the laurels of Microsoftâ€™s last big-hit operating system, Windows 7. Windows 7 has remained the choice for basic and business users alike due to the trend in Microsoft design that emerged after its release; Windows 8 was a grand vision of a button-heavy interface that was intended to mirror the layout of tablets and mobile devices that rose to prominence in recent years. While Windows 8 was not received with acclaim, it did create many die hard Windows 7 users. These users clung to the simplicity and familiarity of a taskbar based GUI (graphical user interface) and feared incompatibility issues that had plagued the Windows release the proceeded it; the dreaded, Windows Vista. Windows 7 marked the last of the traditional layout that Microsoft users had become so accustomed to and Windows 10 continues on the framework that Windows 8 had previously established; if youâ€™re adverse to the layout of Windows 8, Windows 10 may not be the OS for you. Menus have been control panel menus have been consolidated into a series of simplistic categories, while the point of the menus has not changed the verbiage used does vary slightly. The start menu familiar to Windows 7 has been amalgamated into the Windows 8 â€œMetroâ€ layout, which despite Microsoftâ€™s hints, is not identical to the start menu many users have come to rely upon. The situation for Windows 7 users looking to move to Windows 10 is not necessarily bad; there are many improvements especially with relation to performance. One of the most industry-welcomed changes is the departure of Microsoft Internet Explorer (a browser with a troubled past) in favor of Microsoftâ€™s new Edge browser. Edge promises to be dramatically faster than Internet Explorer, while boasting compatibility with established and emerging web standards (those who have used IE on more obscure form-based websites will appreciate this heavily). Windows 10 furthers support for UEFI, leading to faster boot times and easier hardware installation. 10 also touts performance improvements related to power management previously introduced in Windows 8- existing machines can make more effective use of their current â€œhorse powerâ€ at peak usage, while also being drastically more efficient at lower performance levels leading to electricity saving and lighter usage of computer components. One of the biggest draws for Windows 7 refugees may also be the looming end-of-life for this operating system. Much like Windows XP before it, Windows 7 has been given an end of support date of January 14th 2020. While this may seem to be a distant issue, users who previously endured Windows XP upgrades know the reality of a forced upgrade scenario; it is always better to perform a major upgrade before you or your business is dependent upon the upgrade to continue operating. The case for Windows 8.1 users to upgrade to Windows 10 is a drastically less polar situation than the situation posed to users of earlier versions of Windows. Visual changes are slight, and widely relate to the start menu; a change welcomed by many who were disgruntled with the drastic visual overhaul imposed in the â€œMetroâ€ start menu in Windows 8.1. The â€œtileâ€-based start menu is no longer the default Windows desktop (although it can be turned on for tablet/touchscreen users), the â€œcharmsâ€ menu has been removed (many users didnâ€™t know it was there to begin with), and control panel menus have been consolidated further into more descriptive category-based groupings. Windows 8.1 has always had an advantage when it comes to performance in contrast to previous Windows iterations, and Windows 10 continues to carry this torch. Windows 10 has better boot times, increased driver support, and a more responsive update service when compared to Windows 8.1. With the exception of the omission of the â€œcharmsâ€ menu (a favorite here at Turbo Technicians), Windows 10 is a no-brainer for current Windows 8.1 users, offering mostly behind-the-scenes changes that only seek to improve upon Windows 8.1â€™s framework. While it may seem overwhelming, it is very easy to narrow down your options. No matter your thoughts on the upgrade; Microsoft allows for a user to reserve their free upgrade for up to one year- if you think you may upgrade in the future. However, we at Turbo Technicians have found that downgrading from Windows 10 back to Windows 8 or 7 can often come with many issues or not work at all! Windows 7 users will have to adapt to visual changes, but these are nearly identical to the changes posed by Windows 8 and so this may be unavoidable as Windows 7 is discontinued in 2020. For Windows 8.1 users; the transition visually and performance wise will be similar when upgrading to Windows 10. Windows 7 users should, in our opinion, make an accurate appraisal of how comfortable they are with new technology and establish how worthwhile they would find the upgrade, although there are some benefits, many users (especially is the business arena) will not want to add any changes or complexity to their â€œdaily driverâ€ setups. For home users make sure you backup your data before upgrading to Windows 10 and be wary of the many still looming issues that have no been fixed and the continuing privacy issues and forced Windows 10 updates. For business users we do not recommend upgrading to Windows 10 at this time unless you can afford potential downtime and increased IT costs for not that much benefit at this time. Eventually, everyone will have to switch to Windows 10 and future operating systems but for now let’s wait a few more months for Microsoft to work out all the bugs before you utilize your free upgrade. As with any software upgrades, Turbo Technicians has the skill and expertise to perform or advise your business through Windows 10 migration. If you or your business would like to upgrade or simply have more questions related to Windows 10. By turbotechnicians|2019-02-19T11:58:45+00:00February 2nd, 2016|Operating Systems|Comments Off on Windows 10: Should You Upgrade?